For many DBAs, a SQL Server installation can be tough. Read this excerpt from Dusan Petkovic's book on Microsoft SQL Server 2012. Which SQL Server components should be installed? Where will the root directory be stored? Should multiple instances of the Database Engine be used? Which authentication mode for the Database Engine should be used? The following subsections discuss these topics. Before you start the installation process, you should know exactly which SQL Server components you want to install. Figure 2-1 shows a partial list of all the components. 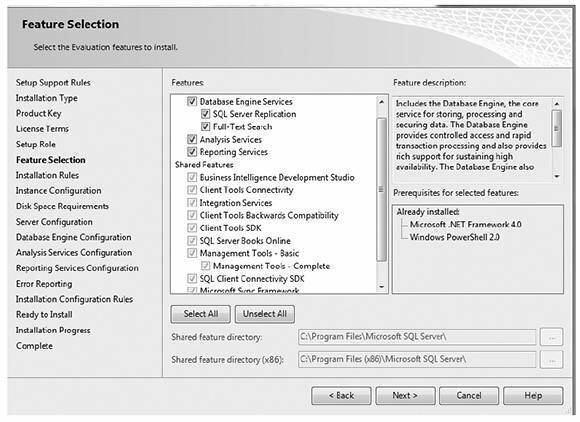 You will see this Feature Selection page again when you install SQL Server later in this chapter, but knowing ahead of time which components you want to select means you don’t have to interrupt the installation process to do research. There are two groups of components on the Feature Selection page: main features and shared features. This section introduces only the main components. For a description of the shared components, refer to SQL Server Books Online. The first item in the list of the main features is Database Engine Services. The Database Engine is the relational database system of SQL Server. Parts II and III of this book describe different aspects of the Database Engine. The first of the two features under Database Engine Services, SQL Server Replication, allows you to replicate data from one system to another. In other words, using data replication, you can achieve a distributed data environment. Detailed information on data replication can be found in Chapter 18. The second feature under Database Engine Services is Full-Text Search. The Database Engine allows you to store structured data in columns of relational tables. By contrast, the unstructured data is primarily stored as text in file systems. For this reason, you will need different methods to retrieve information from unstructured data. Full-Text Search is a component of SQL Server that allows you to store and query unstructured data. Chapter 28 is dedicated to Full-Text Search. Besides the Database Engine, SQL Server comprises Analysis Services and Reporting Services, which are components related to business intelligence (BI). Analysis Services is a group of services that is used to manage and query data that is stored in a data warehouse. (A data warehouse is a database that includes all corporate data that can be uniformly accessed by users.) Part IV of this book describes SQL Server and business intelligence in general, while Chapter 22 discusses Analysis Services in particular. Reporting Services allows you to create and manage reports. This component of SQL Server is described in detail in Chapter 24. The root directory is where the Setup program stores all program files and those files that do not change as you use the SQL Server system. By default, the installation process stores all program files in the subdirectory Microsoft SQL Server, although you can change this setting during the installation process. Using the default name is recommended because it uniquely determines the version of the system. With the Database Engine, you can install and use several different instances. An instance is a database server that does not share its system and user databases with other instances (servers) running on the same computer. The default instance operates the same way as the database servers in earlier versions of SQL Server, where only one database server without instance support existed. The computer name on which the instance is running specifies solely the name of the default instance. Any instance of the database server other than the default instance is called a named instance. To identify a named instance, you have to specify its name as well as the name of the computer on which the instance is running: for example, NTB11901\INSTANCE1. On one computer, there can be several named instances (in addition to the default instance). Additionally, you can configure named instances on a computer that does not have the default instance. The existence of only one SQL Server program group on a computer also means that only one copy of each utility exists, which is represented by an icon in the program group. (This includes SQL Server Books Online, too.) Therefore, each utility works with all instances configured on a computer. You have different types of databases on your computer. Your computer is powerful enough to manage multiple instances. instances of the Database Engine, because of limited resources. For this reason, you should consider the use of multiple instances only with multiprocessor computers. Excerpted from Microsoft SQL Server 2012: A Beginner's Guide, Fifth Edition, by Dusan Petkovic (McGraw-Hill; 2012) with permission from McGraw-Hill. The full chapter is available for free download here. The book is available for purchase here. Windows mode Specifies security exclusively at the operating system level -- that is, it specifies the way in which users connect to the Windows operating system using their user accounts and group memberships. Mixed mode Allows users to connect to the Database Engine using Windows authentication or SQL Server authentication. This means that some user accounts can be set up to use the Windows security subsystem, while others can use the SQL Server security subsystem in addition to the Windows security subsystem. Microsoft recommends the use of Windows mode.